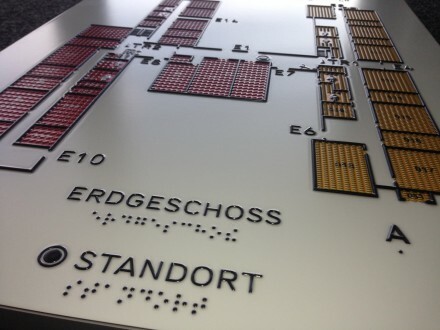 According to the german DIN 18040, information for the use of buildings must also be made perceptible by people with sensory impairments through suitable equipment. 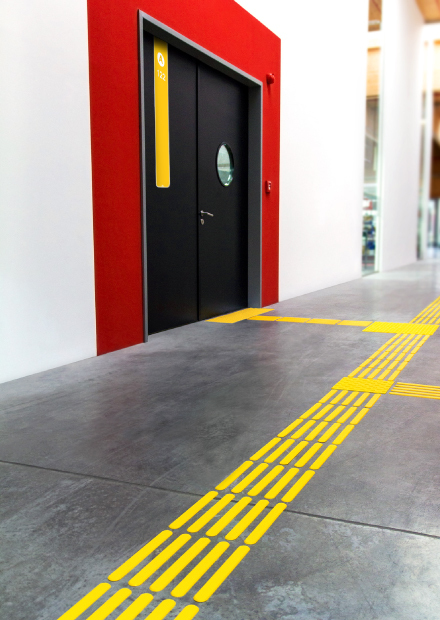 In other words, essential access elements of a building (for example, entrances, exits, stairs and elevators) must be arranged, characterized and signposted so that the blind and visually impaired can easily find and use them. By considering accessibility in buildings, the main focus is on how an orientation works optimally and holistically in the building. Although barrier-free elements primarily serve people with disabilities, many elements are also very helpful for everyday life. Floor markers, staircases and also a good signposting, serve everyone, whether disabled or not. For emergency rescue operations or in emergencies, clear signs and barrier-free elements help save valuable time and arrive quickly at the place where help is needed. It should be borne in mind that a well-designed barrier-free building is of benefit to all. Handrails are usually round or oval and have a diameter of 3 cm to 4.5 cm (1.2 till 1,75 inch). Rounded connections and an assembly with a minimum distance of 5 cm from the wall protect against injuries. For better visibility, they should contrast visually from the background. Blinds are used to provide handwriting signs with tactile information such as floor space and room numbers as well as directional indications. The handrail signs are equipped with tactile letters and blinds. They are highly recommended in large, angled buildings as well as in residential buildings with more than two storeys. Individual adjustments to existing handrail forms or subsoils are possible. 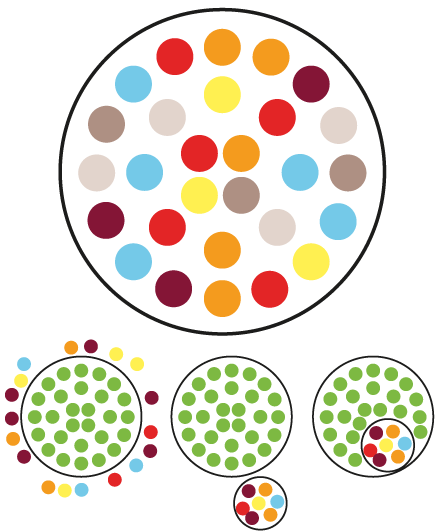 The german DIN 32975 (Edition: 2009-12) specifies requirements for the design of optical information for publicly accessible areas. The guidelines are intended to improve safety, orientation and mobility for people with and without visual impairment. The information in the sense of this standard includes, for example, signposting and routing systems. 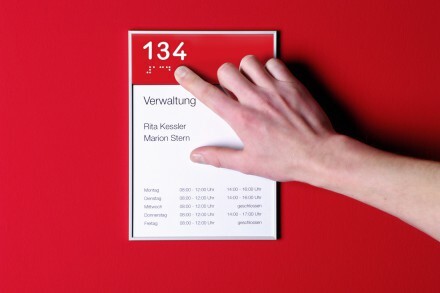 The german DIN 32986 (Edition: 2015-01) regulates the labeling of, for example, handrails, doors, elevator stands, control elements, as well as location plans and reliefs with a Braille and raised logo and pictograms. 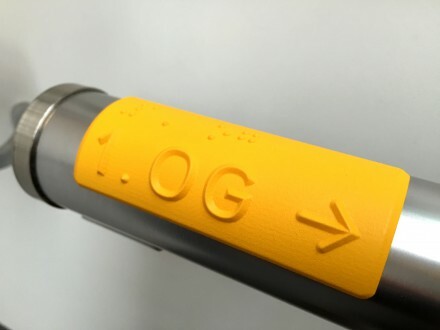 It specifies requirements and dimensions for the braille inscription (inscription) and sublime profiling for indoor and outdoor use. Floor indicators are used as orientation aids for blind and visually impaired persons, and they draw attention to the dangers. The german DIN 32984 (edition: 2011-10) specifies how they are designed and arranged in publicly accessible facilities, traffic facilities as well as road areas. Even the installation of the simple FLS facilitates the orientation in the buildings for people with sensory limitations. All elements are tactile and available in all FLS colors.